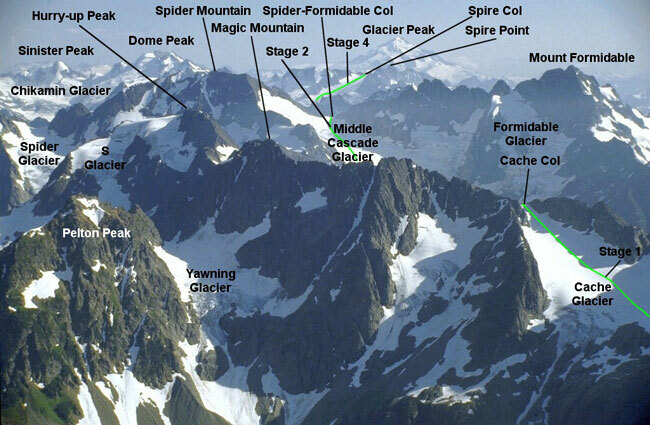 According to many Washington State alpinists, the Ptarmigan Traverse is the classic alpine traverse in Washington. 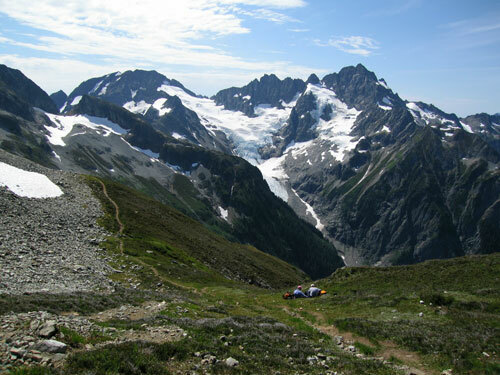 It is unique in that it generally requires a week-long commitment on an off-trail route which weaves its way between the glaciated peaks of the North Cascades. It is a route that one should try only if they have climbing and glacier experience. An overview photo of the Traverse from Sahale Peak to the north. Note the green route lines for stages 1, 2, and 4 ("standard" schedule). Stage 3 is entirely hidden behind Spider Mountain. The highest point on the Traverse proper is Spire Col at just over 7,800 feet. Photo and Annotation compliments of Robert Bolton. The "Stages" are described here. In early August 2006, Los Alamos Mountaineers Gregg Brickner, Dennis Brandt, and Norbert & Lynn Ensslin attempted the traverse, betting on this time of year to give them the best shot at good weather. As always, the Northern Cascades offers brilliant views of glaciated peaks, campsites near clear mountain lakes, colorful wildlife, and an alpine grandeur that takes your breath away. down to Kool Aid Lake, just after we climbed Cache Glacier. Lynn met her husband at the Los Alamos Mountaineers climbing school in the 1980�s and has rock climbed with him and friends since then. Her glacier experience is limited to a few traverses in the Cascades and in Colorado. She loves hiking on the sandstone domes and canyons of Utah and Arizona, and hiking in Colorado�s mountains. Her favorite climbing areas are Tuolumne Meadows in California and City of Rocks in Idaho. Dennis has been involved in mountaineering activities for the past 36 years. His first trip was a Grand Canyon backcountry adventure in 1973 lead by Merlin Wheeler. Dennis took the Los Alamos Mountaineers climbing school in 1974 and has been continuously involved in outdoor activities ever since. His Early Mountaineering experiences focused on Arizona canyon trips, local rock climbing, climbing Colorado's 14ers, climbing volcanoes in Mexico, mountaineering in the Pacific Northwest and caving in southern New Mexico. Dennis served as the club's president in 1987 and 2009, and he was the the clubs Vice-President and Climbing School Director in 1986.